This article is about the city Sopot in Poland. For other places with the same name, see Sopot (disambiguation). Sopot [ˈsɔpɔt] ( listen) (Kashubian: Sopòt; German: Zoppot ( listen)) is a seaside resort city in Eastern Pomerania on the southern coast of the Baltic Sea in northern Poland, with a population of approximately 40,000. 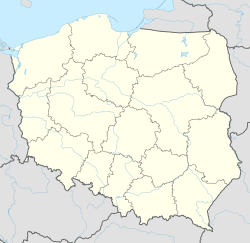 Sopot is a city with powiat (county) status, in Pomeranian Voivodeship. Until 1999 Sopot was part of the Gdańsk Voivodeship. It lies between the larger cities of Gdańsk to the southeast and Gdynia to the northwest. The three cities together make up the metropolitan area of Tri-City. The name is first recorded as Sopoth in 1283 and Sopot in 1291. The German Zoppot is a Germanization of the original Slavic name. In the 19th century and in the interwar years the German name was re-Polonized as Sopoty (a plural form, closer to the German pronunciation). "Sopot" was made the official Polish name when the town came again under Polish rule in 1945. The area of today's Sopot contains the site of a 7th-century Slavonic (Pomeranian) stronghold. Initially it was a commercial trade outpost for commerce extending both up the Vistula river and to cities north across the Baltic Sea. With time the significance of the stronghold diminished and by the 10th century it was reduced to a fishing village, eventually abandoned. However, a century later the area was settled again and two villages were founded within the borders of today's' city: Stawowie and Gręzowo. They were first mentioned in 1186 as being granted to the Cistercian abbey in Oliwa. Another of the villages that constitute today's Sopot, Świemirowo, was first mentioned in 1212 in a document by Mestwin I, who granted it to the Premonstratensian (Norbertine) monastery in nearby Żukowo. The village of Sopot, which later became the namesake for the whole city, was first mentioned in 1283 when it was granted to the Cistercians. By 1316, the abbey had bought all villages in the area and became the owners of all the area of the city. After the Second Peace of Thorn (1466) the area was reincorporated into the Kingdom of Poland. The spa for the citizens of Gdańsk has been active since the 16th century. Until the end of that century most noble and magnate families from Gdańsk built their manor houses in Sopot. During the negotiations of the Treaty of Oliva King John II Casimir lived in one of them, while Swedish negotiator Magnus de la Gardie resided in another — it has been known as the Swedish Manor ever since. During the 1733 War of the Polish Succession, Imperial Russian troops besieged the nearby city of Gdańsk and a year later looted and burned the village of Sopot to the ground. Much of Sopot would remain abandoned during and after the conflict. In 1757 and 1758 most of the ruined manors were bought by the Pomeranian magnate family of Przebendowski. General Józef Przebendowski bought nine of these palaces and in 1786 his widow, Bernardyna Przebendowska (née von Kleist), bought the remaining two. Sopot was annexed by the Kingdom of Prussia in 1772 in the First Partition of Poland. Following the new laws imposed by King Frederick the Great, church property was confiscated by the state. The village was reconstructed and in 1806 the area was sold to the Danzig merchant Carl Christoph Wegner. In 1819, Wegner opened the first public bath in Zoppot and tried to promote the newly established spa among the inhabitants of Danzig, but the undertaking was a financial failure. However, in 1823 Dr. Jean Georg Haffner, a former medic of the French army, financed a new bath complex that gained significant popularity. In the following years, Haffner erected more facilities. By 1824, a sanatorium was opened to the public, as well as a 63-metre pier, cloakrooms, and a park. Haffner died in 1830, but his enterprise was continued by his stepson, Ernst Adolf Böttcher. The latter continued to develop the area and in 1842 opened a new theatre and sanatorium. By then the number of tourists coming to Zoppot every year had risen to almost 1,200. In 1870 Zoppot saw the opening of its first rail line: the new Danzig-Kolberg rail road that was later extended to Berlin. Good rail connections added to the popularity of the area and by 1900 the number of tourists had reached almost 12,500 a year. In 1873, the village of Zoppot became an administrative centre of the Gemeinde. Soon other villages were incorporated into it and in 1874 the number of inhabitants of the village rose to over 2,800. At the beginning of the 20th century it was a favourite spa of Emperor Wilhelm II of Germany. The city again became a holiday resort for the inhabitants of nearby Danzig, as well as wealthy aristocrats from Berlin, Warsaw, and Königsberg. Soon after World War I, a casino was opened in the Grand Hotel as the primary source of money for the treasury of the Free City of Danzig. In 1877, the self-government of the Gemeinde bought the village from the descendants of Dr. Haffner and started its further development. A second sanatorium was constructed in 1881 and the pier was extended to 85 metres. In 1885, the gas works were built. Two years later, tennis courts were built and the following year a horse-racing track was opened to the public. There were also several facilities built for the permanent inhabitants of Zoppot, not only for the tourists. Among those were two new churches: Protestant (September 17, 1901) and Catholic (December 21, 1901). On October 8, 1901, Wilhelm II granted Zoppot city rights, spurring further rapid growth. In 1904 a new balneological sanatorium was opened, followed in 1903 by a lighthouse. In 1907, new baths south of the old ones were built in Viking style. In 1909 a new theatre was opened in the nearby forest within the city limits, in the place where today the Sopot Festival is held every year. By 1912, a third complex of baths, sanatoria, hotels, and restaurants was opened, attracting even more tourists. Shortly before World War I the city had 17,400 permanent inhabitants and over 20,000 tourists every year. Pier in Sopot. The longest wooden pier in Europe, 450 metres from the edge of the shore, 650 m total. Following the signing of the Treaty of Versailles in 1919, Zoppot became a part of the Free City of Danzig. Due to the proximity of the Polish and German borders, the economy of the town soon recovered. The new casino became one of the main sources of income of the free-city state. In 1927, the city authorities rebuilt the Kasino-Hotel, one of the most notable landmarks in Sopot today. After World War II, it was renamed as the Grand Hotel and continues to be one of the most luxurious hotels in Poland. A Richard Wagner festival was held in the nearby Forest Opera in 1922. The festival's success caused Zoppot to be sometimes referred to as the "Bayreuth of the North". In 1928, the pier was extended to its present length of 512 metres. Since then it has remained the longest wooden pier in Europe and one of the longest in the world. In the early 1930s the city reached its peak of its popularity among foreign tourists — more than 30,000 annually (this number does not include tourists from Danzig itself). However, by the 1930s, tensions on the nearby Polish-German border and the rising popularity of Nazism in Germany saw a decline in foreign tourism; in 1938 local German Nazis burned down Zoppot's synagogue. World War II broke out on September 1, 1939. The following day the Free City of Danzig was annexed by Nazi Germany and most of the local Poles, Kashubians, and Jews were arrested and imprisoned or expelled. Due to the war, the city's tourist industry collapsed. The last Wagner Festival was held in 1942. Zoppot remained under German rule until 1945. On March 23, 1945, the Soviet Army took over the city after several days of fighting, in which Zoppot lost approximately 10% of its buildings. As per the Potsdam Conference, Zoppot was incorporated into the post-war Polish state and renamed Sopot. The authorities of Gdańsk Voivodeship were located in Sopot until the end of 1946. Most of the German inhabitants who had remained in the city after the evacuation before the advancing Red Army were soon to be forcibly expelled from their homes, to make room for eastern settlers from Polish areas annexed by the Soviet Union. Sopot recovered rapidly after the war. A tramway line to Gdańsk was opened, as well as the School of Music, the School of Maritime Trade, a library, and an art gallery. During the city presidency of Jan Kapusta the town opened an annual Arts Festival in 1948. In 1952, the tramways were replaced by a heavy-rail commuter line connecting Gdańsk, Sopot, and Gdynia. Although in 1954 the School of Arts was moved to Gdańsk, Sopot remained an important centre of culture, and in 1956 the first Polish jazz festival was held there (until then jazz had been banned by the Communist authorities). This was the forerunner of the continuing annual Jazz Jamboree in Warsaw. In 1961, the Sopot International Song Festival was inaugurated, although it was held in Gdańsk for its first three years – it moved to its permanent venue at Sopot's Forest Opera in 1964. In 1963, the main street of Sopot (Bohaterów Monte Cassino, "the Heroes of Monte Cassino") was turned into a pedestrian-only promenade. New complexes of baths, sanatoria, and hotels were opened in 1972 and 1975. By 1977, Sopot had approximately 54,500 inhabitants, the highest ever in its history. In 1979, the historical town centre was declared a national heritage centre by the government of Poland. In 1995, the southern bath and sanatoria complex were extended significantly and the Saint Adalbert spring opened two years later, as a result in 1999 Sopot regained its official spa town status. In 2001, Sopot celebrated the 100th anniversary of its city charter. Sopot is currently undergoing a period of intense development, including the building of a number of five star hotels and spa resorts on the waterfront. The main pedestrianized street, Monte Cassino, has also been extended by diverting traffic underneath it, meaning the whole street is now pedestrianized. Sopot, aside from Warsaw boasts the highest property prices in Poland. The city is covered by both the Gdynia and Gdańsk municipal bus lines, the regional commuter rail line (with three stops in the city: Sopot Wyścigi, Sopot, and Sopot Kamienny Potok), and the Polish national railway, PKP. Sopot is one of four Polish towns to have trolleybuses. The others are Lublin, Tychy and Gdynia. There are many popular professional sports teams in Sopot and the tri-city area. The most popular in Sopot today is probably basketball thanks to the award-winning Prokom Trefl Sopot. Amateur sports are played by thousands of Sopot citizens, as well as in schools of all levels (elementary, secondary, and university). Sopot held the IAAF World Indoor Championships in 2014. Idea Prokom Open - ATP and WTA tennis tournament held in August. Rafael Nadal and Flavia Pennetta won in 2004. Ogniwo Sopot (MKS Ogniwo Sopot) is a rugby club, founded in 1965. Since the 80s, Ogniwo is one of the best Polish rugby teams. They were undefeated since 1989 to 1993, with Edward Hodura as a coach. Klub Piłkarski Sopot (KP Sopot) - football club founded in 1987. In the 2007/08 season it won the Regional Polish Cup. Spot was the training base for the Republic of Ireland during the European Championships in 2012. ^ amk (2009-12-25). "O sopockiej Polonii po latach". rp.pl. Retrieved 2013-03-12. ^ GUS: Bank Danych Lokalnych, faktyczne miejsce zamieszkania, stan na 31 XII. Wikimedia Commons has media related to Sopot, Poland. Wikivoyage has a travel guide for Sopot.